Major U.S. apparel companies continue to put at risk the lives of the workers in South Asian factories who sew their clothing by covering up problems identified in confidential audits and ignoring best fire safety practices, according to a new report published today by the Washington, DC-based International Labor Rights Forum (ILRF). In the wake of recent factory fires in Bangladesh and Pakistan that have killed hundreds of apparel workers, ILRF calls on apparel companies to put a stop to the epidemic of garment factory fires in South Asia by sharing their knowledge about workplace hazards openly, paying sufficient prices to factories for necessary building repairs, and respecting the voices of workers. The 60-page report, titled Deadly Secrets, exposes how apparel companies are putting workers’ lives at risk by not publically sharing knowledge of fire hazards in their supplier factories. Last month, 112 workers died in a garment factory fire in Bangladesh and two months prior 262 workers died in a garment factory fire in Pakistan. Both factories produced clothes for major western retailers. While these garment factory fires are the deadliest in both countries to date, they are part of a horrific trend. 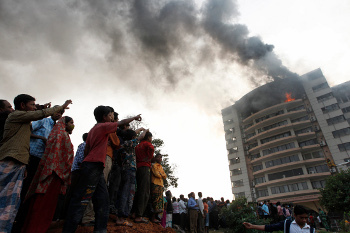 ILRF’s report shows that since 1990 over 1000 workers have died in preventable factory fires and other unsafe workplace incidents in Bangladesh alone. Over 700 of those deaths have occurred since 2005. Sixty percent of Bangladesh’s garment factories lack adequate fire-fighting tools and many factories do not have emergency exits. Join Bangladeshi and international unions and labor groups that are calling on Gap to commit to a meaningful fire safety program that will protect the lives of the company’s sweatshop workers. Send a letter to Gap today!